Researchers at the Mount Sinai School of Medicine and The University of Sydney, Australia have discovered a previously unknown mechanism of drug resistance in a subtype of melanoma patients. Led by Emily Bernstein, Ph.D., associate professor of oncological sciences and dermatology at the Icahn School of Medicine at Mount Sinai, they identified a novel epigenetic mechanism that causes resistance to the standard treatment in those melanoma patients that harbor a specific mutation in the BRAF gene known as BRAFV600E. They also identify a potential new therapy that could prevent or reverse drug resistance in these patients. BRAF is a serine/threonine protein kinase that activates the MAP kinase/ERK-signaling pathway. Roughly half of melanomas harbor activating BRAF mutations, over 90% of which are the specific mutation, BRAFV600E. This partcular mutation, which results in a constitutively activated BRAF, has been implicated in different mechanisms underlying melanomagenesis, most of which are due to the deregulated activation of the downstream MEK/ERK effectors. Recently, the BRAF pathway, and this mutation specifically, have been the focus of extensive therapeutic development. 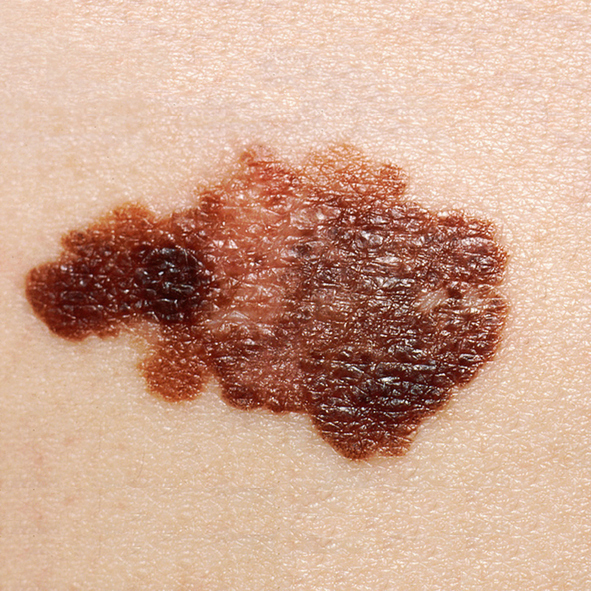 “The incidence of cutaneous malignant melanoma is rising and its therapeutic management remains challenging,” said Bernstein. One of the challenges is the development of resistance to the standard therapy. “In recent years, there has been extensive therapeutic development to inhibit key biological targets. Although a large proportion of patients with advanced metastatic melanoma harboring BRAF mutations respond to the standard therapy, known as MAPK inhibitors (MAPKi), subsequent resistance remains a major clinical challenge,” Berstein explained. The researchers sought to investigate the epigenetic and, more specifically, chromatin-mediated mechanisms involved in melanoma resistance to MAPKi. To do that, they performed a CRISPR-Cas9 screen in BRAFV600E human melanoma cells targeting chromatin modifiers. The CRISPR-Cas9 screen uncovered that haploinsufficiency of the histone deacetylase SIRT6 allows melanoma cell persistence in the presence of MAPKi. “Haploinsufficiency, but not complete loss of SIRT6 promotes IGFBP2 expression via increased chromatin accessibility, H3K56 acetylation at the IGFBP2 locus, and consequent activation of the IGF-1 receptor (IGF-1R) and downstream AKT signaling,” reported the authors. The study not only identified a previously unknown epigenetic mechanism of melanoma drug resistance, but also identified SIRT6 as a regulator of resistance to dabrafenib and the combination dabrafenib + trametinib. Further, their work identifies that co-targeting of MAPK and insulin signaling pathways may overcome resistance to MAPKi for a subset of BRAF mutant melanoma patients. Patients with high levels of IGFBP2 could benefit from combination therapies. The authors wrote that their data “strongly suggest that co-targeting of MAPK and IGF-1R pathways can prevent/delay resistance to targeted MAPKi therapies, particularly for patients with high levels of IGFBP2.” IGFBP2 levels are able to be detected in urine, increasing its potential as a biomarker.